Goddes Tripur Sundari is also called Shodashi because she posses all the sixteen supernatural powers (Kala). Goddess Shodashi is the most enchanting beauty of all the ten great learning’s. She has a noose, a hook, a bow and an arrow in each of her hands. Eveready to shower blessings on her devotees, her appearance is completely Somber & gentle and her heart is full of compassion. A devotee who takes her refuge achieves great divinity like the deities. In fact her splendors are indescribable. Even the Vedas are incapable of describing her greatness. Being pleased with her devotee she gives more than he demands. 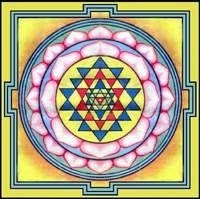 Before chanting the mantras the Shodashi Yantra should be properly worshipped. Worship - Normally, wishes and aspirations get fulfilled if either the cryptic mantra or the other mantras are chanted for 5,00000 times (five lakhs), with full faith and devotion. The chanting of the mantras can be raised according to the requirement. If goddess Shodashi is pleased then all the aspirations of man gets fulfilled and he is saved from the dangerous alamities.